This Halloween has been my most favourite ever! It's so much better to enjoy these holidays when theres children around. Even though Luke is only 20 weeks, I still made sure I went that extra bit with the celebrations. I hosted my first ever kids / Halloween party...and boy am I tired after that! :) The majority of my friends all have young children so thought it wold be nice to get them all together to sure in some scary fun. Luke has been a bit poorly and got a bit worked up half way through but other than that he was a trooper. He was joined by his best friends Aoibhinn and Ellie plus many more. I picked up most of Halloween decorations in Aldi and Tesco along with some goodies, but this morning was spent in the kitchen baking. I made some fairy cakes, the Boy made biscuits and a coffin shaped cake and my right hand girl, Katie made some rice krispie cakes, it was a busy kitchen! We added some scary touches to our Halloween cakes with some food colouring and spooky sprinkles. 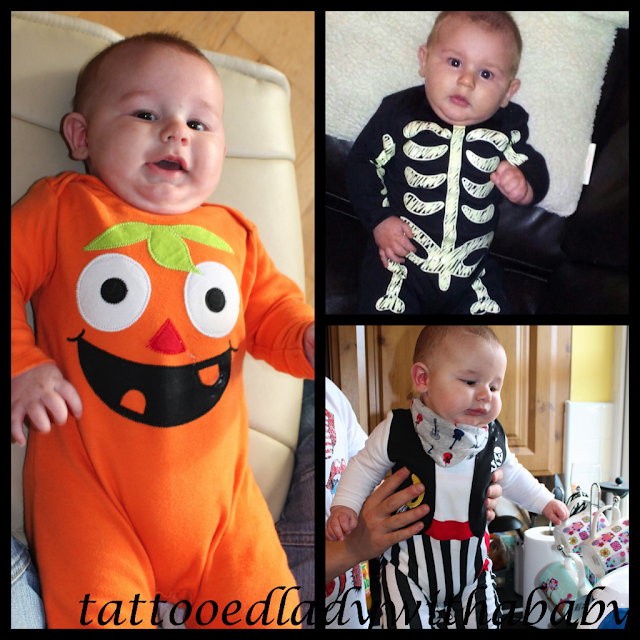 He had too many outfits so it turned into more of a Halloween week!